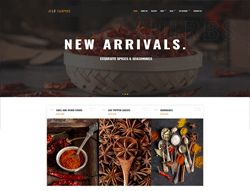 LT Taspice is Responsive Virtuemart Joomla template tailored for spice shop online. This is web marketplace which is perfect to promote spices give flavor to our food and our life by high-quality images that make your clients begin an amazing journey that covers the entire world. Spice Shop VirtueMart Joomla template is designed to attract viewers with gorgeous images and amazing background colors. With a simple back panel and an easy to follow set of instructions, these templates can be installed and configured by anyone. Spices have the gift to inspire creativity and beautiful thoughts and this is why large images depicting a variety of spices will have a charming effect on anyone landing your page. The great online experience is completed by advanced features like social options and search engine friendly. LT Taspice is integrated with VirtueMart and may display products using 8 available views. It is 100% responsive, clean and stylish. The template comes with 4 colors schemes, but in fact it is really customizable, has drag and drop tools and color settings helping to create unique websites with various layouts. Template framework support page builder, mega menu, unlimited position layout and multi-language.